Aug 6 (GIN) – Robert Mugabe’s wide lead in the just-ended presidential poll over his long time rival, Morgan Tsvangirai, may have ended a years-long struggle between the two men for the nation’s top spot. Pres. 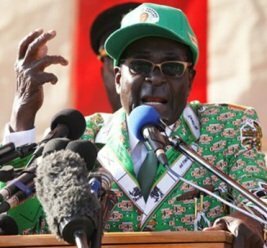 Mugabe trounced his rival, Prime Minister Tsvangirai, capturing 2 million votes or 61 percent of the July 31 vote total. With that, the victorious 89 year old President extends by another 5 years his 33-year rule of the southern African nation. Prime Minister Tsvangirai, who captured one million or 34 percent of the votes, is challenging the outcome, presenting evidence of fingerprint ink that wore off (allowing multiple votes), multiple IDs, missing voter lists, names of the dead listed on voter rolls, among other acts. Zimbabwe’s population is over 13 million with more than 3 million abroad as economic fugitives or asylum seekers, according to U.N. and World Bank reports. Kenya, Tanzania and South Africa all sent congratulations to the re-elected President. Neighboring Botswana broke ranks with other African observers, saying that conditions for free and fair elections were not met because of widespread irregularities including delayed voter lists, and voters being turned away at the polls. Despite the multiple challenges to his victory, the President unveiled a new economic initiative in which foreign banks and mines will be seized and redistributed to local investors. Under the initiative, ordinary people will take charge of their economy through a “unique wealth-transfer model,” the party announced in a statement released to the press. “The people of Zimbabwe have given President Robert Mugabe and (his party) ZANU-PF a clear mandate to transform the economy through indigenization and economic empowerment,” said Minister Saviour Kasukuwere in a BBC interview. Bank owners will be compensated as Zimbabwe takes control of their companies but foreign companies will be compelled to turn over 51 percent of their assets to black investors without compensation. Non-compliant mine owners risk losing their licenses, he said. The initiative is expected to add $7 billion to the nation’s assets. With a two-thirds majority in parliament, the President’s initiative should sail through without opposition.